The latest version of Suzuki's iconic sportsbike - the legendary Hayabusa - is touching down on the Australian market. The latest version of Suzuki's iconic sportsbike - the legendary Hayabusa - has swooped in on the Australian market. Suzuki is pleased to announce a new look for one of Australia's most iconic high-powered sports motorcycles, the Suzuki Hayabusa, which will soon be available in a striking new Yellow/Black colour scheme. Suzuki has overhauled one of Australia's most popular, high-powered sports motorcycles, the Suzuki Hayabusa, now equipped with Brembo front brakes and the first in Suzuki's sportsbike range to feature an Antilock Brake System (ABS). The 2012 model of Australia's most popular, high-powered sport tourer motorcycle^, the Suzuki Hayabusa has touched down in Australia, sporting a brand new, eye-catching Candy Red colour scheme. 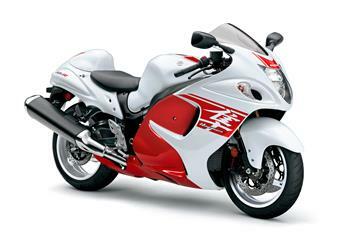 The 2011 model of Suzuki's legendary Hayabusa sportsbike is now available in Australia. The highly anticipated 2010 model of Suzuki's legendary Hayabusa sportsbike is now available in Australia. An exclusive, limited-edition 2008 model Suzuki Hayabusa sportsbike is now available in Australia. Suzuki will unveil a special, limited edition white version of its popular Hayabusa sportsbike at the Brisbane International Motor Show on 1 February. Next Generation Suzuki Hayabusa Is Here! The highly-anticipated new generation, 2008 model of Suzuki's legendary Hayabusa sportsbike is now available in Australia. The latest version of Suzuki's legendary Hayabusa sportsbike is set to break cover in an exclusive preview at this weekend's Brisbane Motorcycle Expo with the highly-anticipated, all-new, 2008 model on display for the first time in Australia. Suzuki Australia has released its 2007-model Hayabusa with a new-look, mono-tone colour scheme and new black frame and swingarm. 2018 Suzuki GSX 1300 Hayabusa.